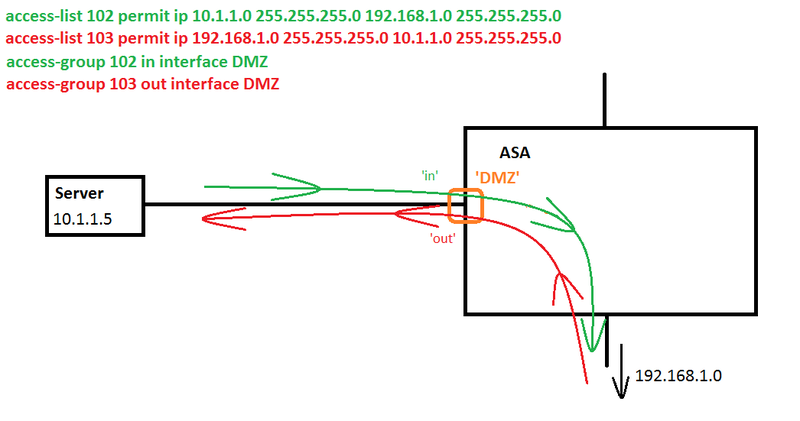 I was asked recently to explain how the 'in' and 'out' works when applying an ACL to an interface. I thought I would demonstrate this with a visual. Red is for outgoing to the interface, green for incoming to the interface. Everything is from the perspective of the interface. So act like you are standing 'in the interface' and face in the direction the interface is pointing, away from the ASA. Then think about incoming and outgoing. Take a look at the drawing below.